With over 20 years of experience in the field of importing and producing plastic machinery, with a specialist and technical staff, and cooperating with the world’s leading brands, the industrial group has been serving the artisans of Iran to provide advanced machinery for the best brands and developments in the business environment. And work. The Hubble Nylon production unit supplied by this group with the highest qualitative standards of the world has the ability to produce in various sizes and capacities, along with pneumatic shafts, auto loader materials, full-invertors, RissiCell, three 10-20-cylinder cylinders, 30, Autochanger and Chiller, are available in two layers, three layers and five layers. Bubble-filled nylon has air-filled bubbles designed to pack delicate, sensitive, or breakable items such as home-made, industrial, light, heavy, sensitive, etc. High-impact and reduce injuries. Freight is used. These nylon are made of polyethylene and are available in a wide, transparent or stylized format. For the packaging of delicate, susceptible or cracked goods, and any type of goods that need to be moved, from home, industrial, light, heavy, sensitive, and so on. Reducing injuries in the transportation of goods. Depending on the type of consumption for fragile and sensitive goods, smaller plastic bubbles and larger plastic bubbles are used for products that require less sensitivity and resistance. In addition to the items mentioned for use, this product, despite the metallization layer, has the ability to reflect the heat and can be used as glass wool in the hollow of the factories. Also, with aluminum for devices with indirect heat Such as water heaters, are used as thermal insulation and play a significant role in optimizing energy consumption. The raw material of this design is weighed to the required ratio and directed to the mixer for mixing. 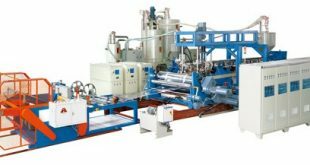 The material is then transferred to the extruder and is passed through the conveyor belt to the inside of the clender to thicken the polyethylene film. By passing the dryer, the film temperature decreases. Finally, the wrapped rolls are cut to the sides and the waste from the cutting is returned to the primary mill and the polyethylene film (nylon) is prepared.